After 13 years and over 27 miles exploring the dry sea bed of Mars' Meridiani Planum, NASA's record-shattering rover Opportunity is still going. 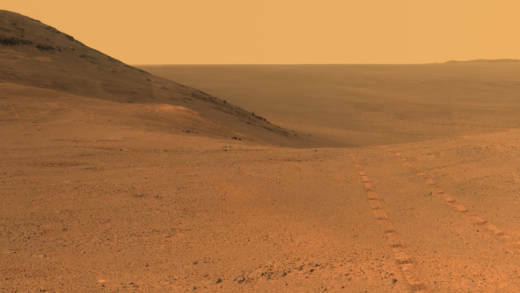 Originally slated for a 90-day tour of Mars, Opportunity's mission has been extended multiple times, making it the longest-operating robot on the red planet. The next longest running, Opportunity's twin Spirit, lasted 8 years, and the Curiosity rover, also prospecting for signs of Mars' watery past since 2012, has traveled a little over 5 miles so far. Now, after it poked about the rim of the giant Endeavour Crater for the last six years, NASA is preparing to send Opportunity on a challenging and risky (dare we say "heroic"?) trek down a fluid-carved canyon that may have been formed by flowing water in the distant past. If this canyon, Perseverance Valley, was the locale of an ancient mega-cascade, what a fitting final mission for a rover that has spent its long career looking for signs of water. Why Has Opportunity Lasted So Long? From a three month mission to 13 years—how has this little rover lasted so long? Did engineers simply underestimate the lifespan for this rolling robot? Or, is this like a Disneyland line where wait times never match expectations? Neither. The 90-day expiration date has less to do with the robot's durability, and more to do with the overall mission plan. Scientists estimate the minimum time a mission should run in order to achieve its goals; anything beyond that is a bonus. After the initial mission duration is reached, it may be given an extension, and at the end of that, perhaps another. Part of the decision for whether and how long to extend a mission is based on funding, but the potential rewards of exploring further also factor in—as has been the case with Opportunity several times. 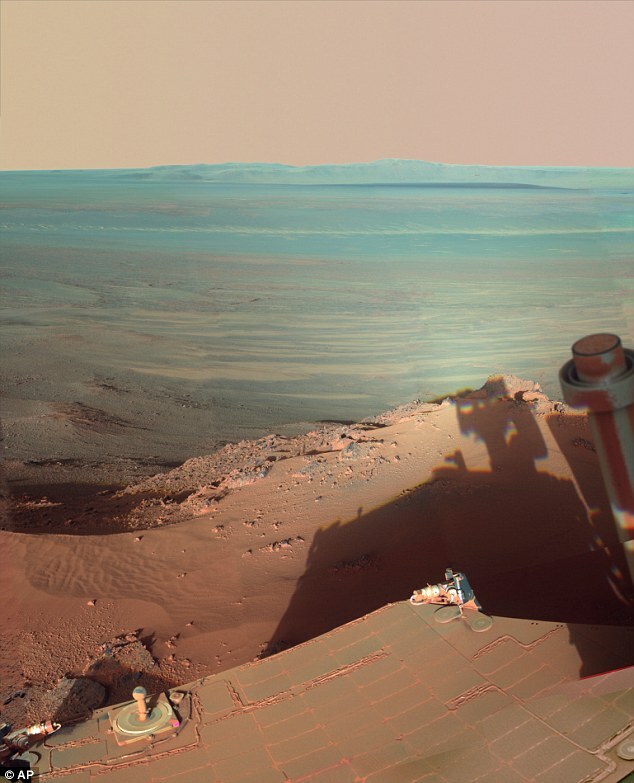 Opportunity began its career in 2004 when it rolled to a stop at the bottom of the 70-foot wide Eagle Crater, in the flat expanse of Meridiani Planum. Right out of the box the rover spied evidence of past water, in the form of layers of sulfate-rich rock that appear to have been laid down in shallow water in Mars' past. NASA operators were concerned that the rover might not be able to climb out of the crater. But if it hadn't rolled to a stop there, it might never have seen sedimentary rock exposed on the inner crater wall. Farther along its travels, Opportunity discovered tiny round, gray spherules of hematite, a mineral that can form by accretion in acidic water. 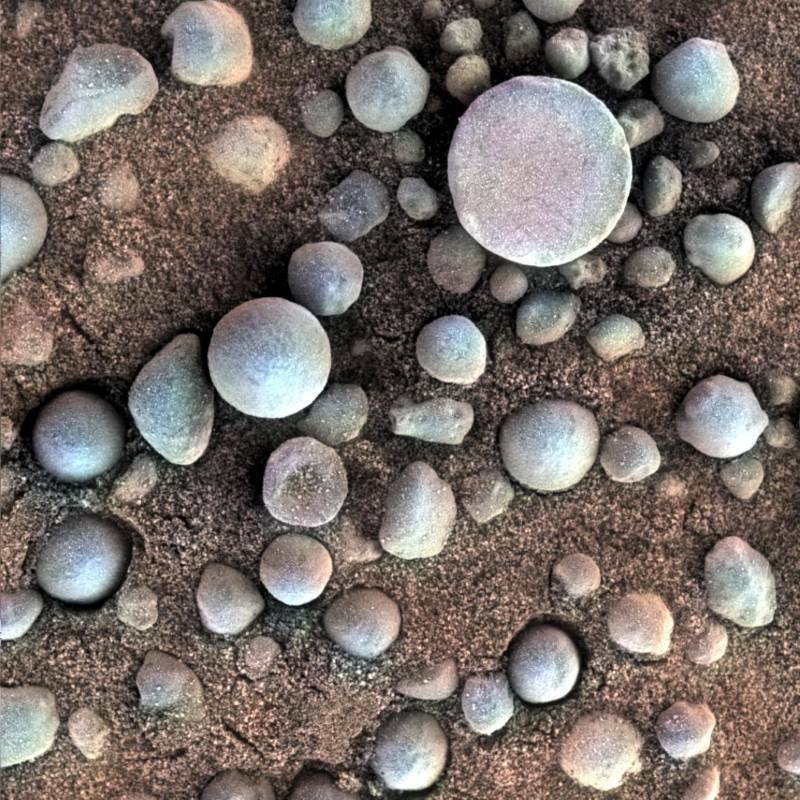 Dubbed "blueberries" because they appeared blue in false-colored images captured by Opportunity's microscopic camera, further study of their distribution in the Meridiani rocks suggested that these spherules most likely did form in water, and not by some other process, such as volcanism or wind action. Opportunity found further stratigraphic evidence of past water in the exposed sedimentary layers of Burns Cliff in Endurance Crater, not far from its landing site. The layered rocks told a story of water that appeared and dried up episodically, indicating that the region underwent wet and dry cycles over time. Though the signs of past water popped up in several places along Opportunity's path, the chemical evidence told us that the water was probably acidic, and not favorable enough to support life. So, past water, yes, but could anything have lived in that water? This question remained open until Opportunity reached Endeavour Crater in 2011. There, Opportunity discovered a vein of minerals containing calcium, sulfur, and water—identified as gypsum—sticking out of the soil along the crater rim. The vein was likely deposited by mineral-rich water flowing through cracks in the rock. That water would have been less acidic than previously sampled locations, with pH levels closer to neutral. This was the first indication in Meridiani Planum of a past watery environment suitable to support life—at least life forms as we know them on Earth. 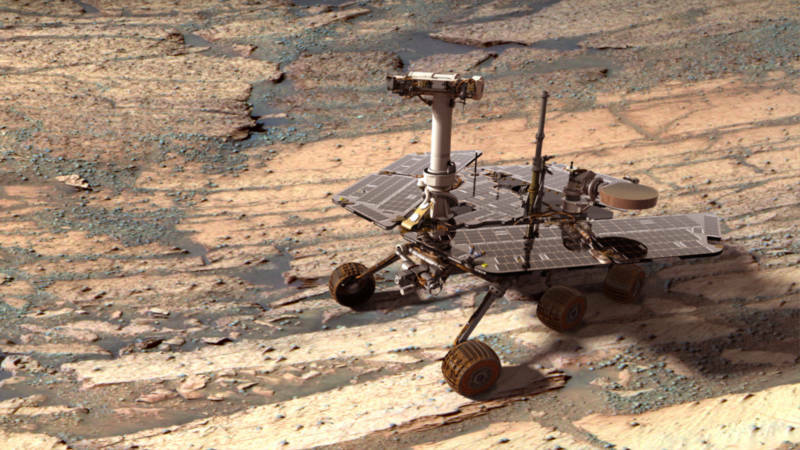 For six years Opportunity has loitered safely on the rim of the Endeavour Crater, nursing a failing front-wheel steering system but quietly continuing its very extended mission. Now, however, NASA has decided that exploring the fluid-carved Perseverance Valley is worth the risk. 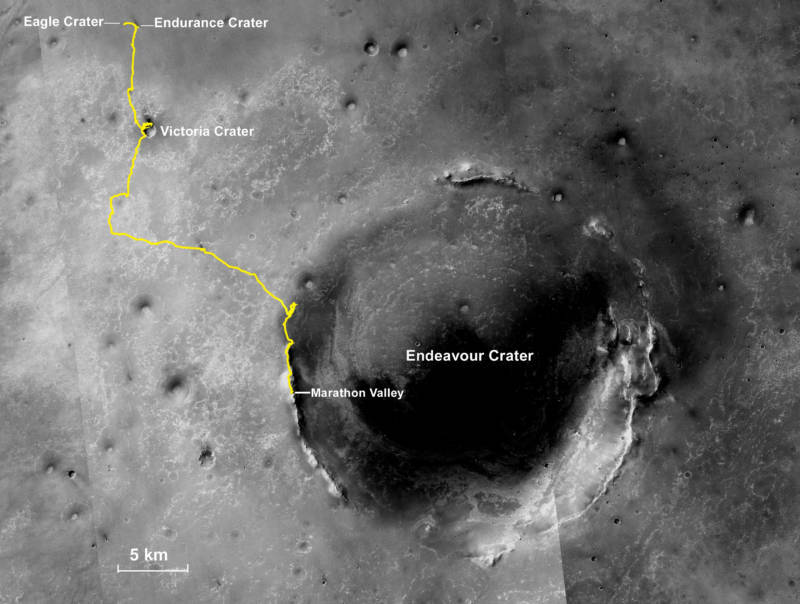 Opportunity could discover that torrents of water once cascaded down the wall of Endeavour Crater and move in for a closer look. The rover spent time examining the spillway leading down into Perseverance Valley before commencing its deeper plunge down stream, to whatever fate awaits it. And who knows? Opportunity has surprised everyone with its longevity and marathon crawl across the Martian surface, so I'm not willing to rule out its safe arrival at the bottom of the mysterious canyon.